Wall Street reacted positively to President Donald Trump’s address to Congress and the nation with the DOW jumping to a new record high, breaking the 21,000 mark. 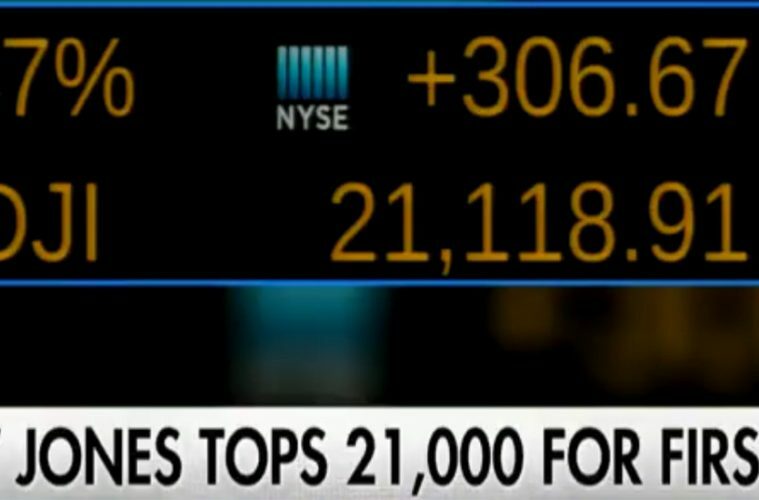 The Dow Jones Industrial Average traded and closed above the 21000 milestone Wednesday for the first time ever in what was one of the fastest 1,000-point advances in the blue-chip index’s history. Optimism on Wall Street came from President Donald Trump’s first address to a joint session of Congress on Tuesday night in which he outlined the ways in which he hoped to “make America great again.” His policy priorities included repealing the Affordable Care Act – a cornerstone of President Barack Obama’s administration, revamping the U.S. tax code, improving trade policies, and requesting Congress approve $1 trillion for infrastructure spending. The president’s speech offered few explicit details about how he plans to move these policy priorities across the finish line, but that didn’t seem to bother U.S. investors much who sent the Dow nearly 200 points higher at the start of trade. “There was little to nothing on deregulation of financial institutions or on what budget cuts will be made to compensate for higher military spending. And he mentioned taxes, but there was next to no meat in any of that,” said Michael Block, chief strategist at Rhino Trading Partners. Previous ArticleWill President Trump Let Social Security and Medicare Go Bankrupt? Next ArticleBeau Biden’s Widow Dating Late Husband’s Married Brother?